This Peppiatt B241c £5 note is a wonderful and rarer Branch banknote. The Hull notes are rare and don't appear for sale very often. 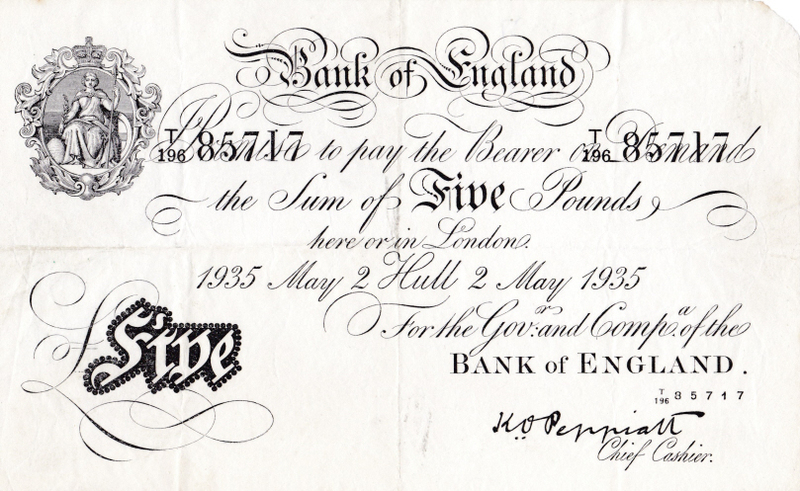 This superb British Banknote from 1935 is a really great example of this type. The EPM value is £1600 which indicates this white £5 note is now a rare one. However, as an addition to a GB banknote collection it is hard to beat. It is on offer at a very competitive price so have a peep and perhaps buy a Peppiatt banknote that will be the highlight of your white banknote collection. Collecting banknotes is a fantastic interest and this note will grace your collection in some style. British banknotes, paper money, has a long history dating back to 1695, the year after the founding of the Bank of England. Over the centuries, banknotes have developed in face value even though for most people until 1914, banknotes were rarely seen or used. 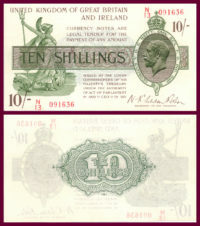 It was after the outbreak of WW1 banknotes were produced with lower values, 10/- and £1. These are ‘Treasury Notes’, signed by the Chief Cashier of the Bank of England, John Bradbury. ‘Bradburys’ and ‘Warren Fisher’ notes are very collectible. Some notes are rare and of great value. Collectors of British banknotes are attracted by their design, rarity, currency history and can be seen as an investment. 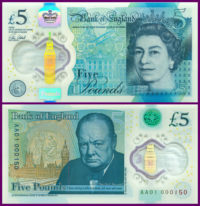 For most, it is a hobby focussing upon a particular aspect such as Treasury Notes, White £5s, Replacement notes, Experimental notes, Errors, Low serial numbers, Debdens, First and Last runs. Amongst the British and World banknotes on offer here, I hope you will find banknotes to enhance your collection. Have a look at the Provincial Notes (English) on offer.